At no prior time in the history of the consumer goods industry has there been more change – or the potential for change – than there is today. 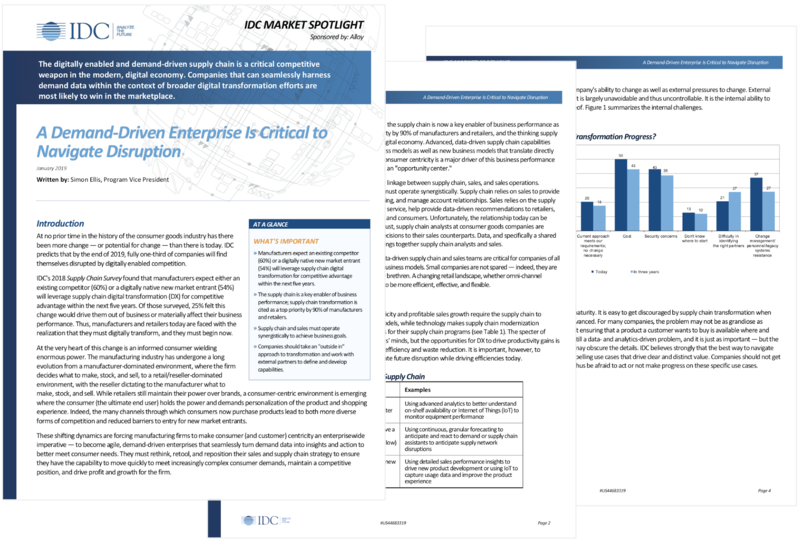 IDC predicts that by the end of 2019, fully one-third of companies will find themselves disrupted by digitally-enabled competition. IDC's 2018 Supply Chain Survey, for example, found that manufacturers expect either an existing competitor (60%) or a digitally-native new market entrant (54%) will leverage supply chain digital transformation (DX) for competitive advantage within the next five years. Of those surveyed, 25% felt this change would drive them out of business or materially affect their business performance. Thus, manufacturers and retailers today are faced with the realization that they must digitally transform, and they must begin now. At the very heart of this change is an informed consumer wielding enormous power. The manufacturing industry has undergone a long evolution from a manufacturer-dominated environment, where the firm decides what to make, stock, and sell, to a retail/reseller-dominated environment, with the reseller dictating to the manufacturer what to make, stock, and sell. While retailers still maintain their power over brands, a consumer-centric environment is emerging where the consumer (the ultimate end user) holds the power and demands personalization of the product and shopping experience. Indeed, the many channels through which consumers now purchase products means both more diverse forms of competition and reduced barriers to entry for new market entrants. These shifting dynamics are forcing manufacturing firms to make consumer (and customer) centricity an enterprise-wide imperative – to become agile, demand-driven enterprises that seamlessly turn demand data into insights and action to better meet consumer needs. They must rethink, retool, and reposition their sales and supply chain strategy to ensure they have the capability to move quickly to meet increasingly complex consumer demands, maintain a competitive position, and drive profit and growth for the firm.